Caribbean cities are a unique yet underexposed phenomenon. Their distinctiveness results from a combination of interrelated factors including a history of slavery, development under the hemispheric hegemony of the United States and spatial limitations imposed by the setting of most Caribbean urban areas. This innovative volume presents a detailed introduction to the spatial, socio-cultural and economic characteristics of the Caribbean city, followed by case studies of selected cities in the Dutch, Hispanophone, Francophone and Anglophone Caribbean. 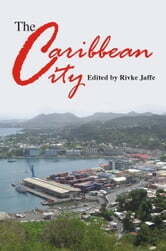 It discusses a broad range of disciplinary approaches in examining the urban Caribbean, incorporating perspectives from anthropology, sociology, history, political science, geography and literary and cultural criticism. Rivke Jaffe is Lecturer in the Department of Sociology, Psychology and Social Work at the University of the West Indies, Mona. Her research interests include Caribbean studies, urban anthropology and the urban environment.